1 MΩ R-VA2X1MA Body Depth 0.9 in. 1 MΩ R-VA2X1MA Body Diameter 0.95 in. 1 MΩ R-VA2X1MA Bushing Length 0.26 in. 1 MΩ R-VA2X1MA Metric Thread Major Diameter 8 mm. 1 MΩ R-VA2X1MA Metric Thread Pitch 0.75 mm. 1 MΩ R-VA2X1MA Shaft Diameter 0.25 in. 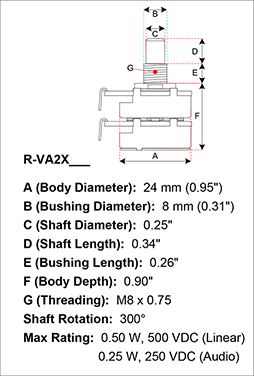 1 MΩ R-VA2X1MA Shaft Length 0.34 in. 1 MΩ R-VA2X1MA Shaft Rotation 300 deg. 1 MΩ R-VA2X1MA Weight 0.042 lbs. 10 kΩ R-VA2X10KA Weight 0.041 lbs. 100 kΩ R-VA2X100KA Body Depth 0.9 in. 100 kΩ R-VA2X100KA Body Diameter 0.95 in. 100 kΩ R-VA2X100KA Bushing Length 0.26 in. 100 kΩ R-VA2X100KA Metric Thread Major Diameter 8 mm. 100 kΩ R-VA2X100KA Metric Thread Pitch 0.75 mm. 100 kΩ R-VA2X100KA Shaft Diameter 0.25 in. 100 kΩ R-VA2X100KA Shaft Length 0.34 in. 100 kΩ R-VA2X100KA Shaft Rotation 300 deg. 100 kΩ R-VA2X100KA Weight 0.042 lbs. 250 kΩ R-VA2X250KA Body Depth 0.9 in. 250 kΩ R-VA2X250KA Body Diameter 0.95 in. 250 kΩ R-VA2X250KA Bushing Length 0.26 in. 250 kΩ R-VA2X250KA Metric Thread Major Diameter 8 mm. 250 kΩ R-VA2X250KA Metric Thread Pitch 0.75 mm. 250 kΩ R-VA2X250KA Shaft Diameter 0.25 in. 250 kΩ R-VA2X250KA Shaft Length 0.34 in. 250 kΩ R-VA2X250KA Shaft Rotation 300 deg. 250 kΩ R-VA2X250KA Weight 0.042 lbs. 50 kΩ R-VA2X50KA Body Depth 0.9 in. 50 kΩ R-VA2X50KA Body Diameter 0.95 in. 50 kΩ R-VA2X50KA Bushing Length 0.26 in. 50 kΩ R-VA2X50KA Metric Thread Major Diameter 8 mm. 50 kΩ R-VA2X50KA Metric Thread Pitch 0.75 mm. 50 kΩ R-VA2X50KA Shaft Diameter 0.25 in. 50 kΩ R-VA2X50KA Shaft Length 0.34 in. 50 kΩ R-VA2X50KA Shaft Rotation 300 deg. 50 kΩ R-VA2X50KA Weight 0.041 lbs. 500 kΩ R-VA2X500KA Body Depth 0.9 in. 500 kΩ R-VA2X500KA Body Diameter 0.95 in. 500 kΩ R-VA2X500KA Bushing Length 0.26 in. 500 kΩ R-VA2X500KA Metric Thread Major Diameter 8 mm. 500 kΩ R-VA2X500KA Metric Thread Pitch 0.75 mm. 500 kΩ R-VA2X500KA Shaft Diameter 0.25 in. 500 kΩ R-VA2X500KA Shaft Length 0.34 in. 500 kΩ R-VA2X500KA Shaft Rotation 300 deg. 500 kΩ R-VA2X500KA Weight 0.041 lbs. All models Packaging Dimensions 1.5 in. x 1.3 in. x 1 in. 1 answers Hi, is pot R-VA2X250KA logarithmic or linear? This pot has an logarithmic(audio) taper pot. 1 answers If I wanted to use this as a tone/tone pot on a J bass, would I want an audio or linear taper? Typically people use audio taper pots for guitars and basses. 1 answers How accurate is the impedance between the two pots on the 50k version? The tolerance between the two pots are +/- 10%. 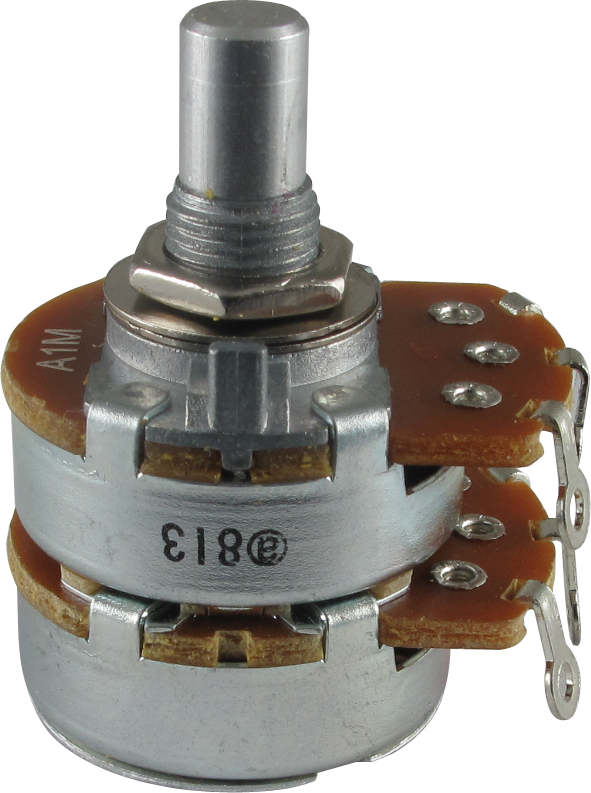 1 answers Why is this pot listed as 1/4W 250VDC when I can't even find that Alpha makes one like that currently. Everything I see is 500VDC and 1/2W which I would prefer anyway. Is the one you have listed this way a typo? The audio taper version are 1/4 watt at 250VDC and the linear taper pots are 1/2 watt at 500VDC. For the linear taper version do a search for: R-VA2XXL.